Showing all 34 items matching your search criteria. 252. 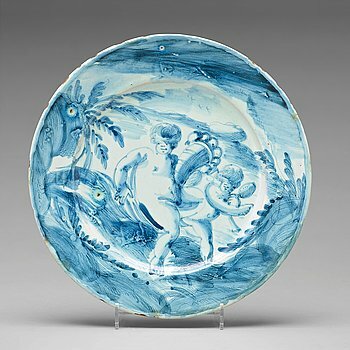 A Savona maiolica dinner plate, Italy circa 1700. 253. 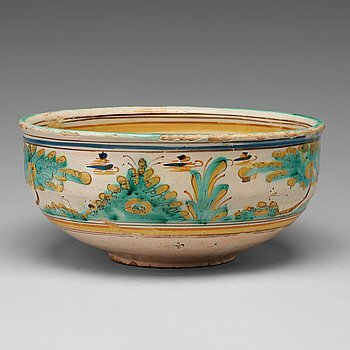 An Italian or Spanish faiance bowl, 18th Century. 254. 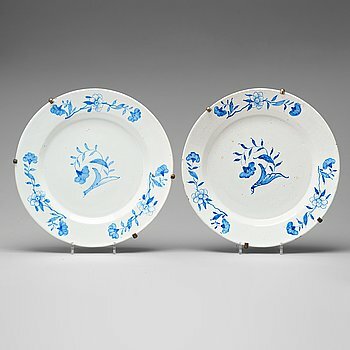 A pair of Swedish faience serving dishes, Rörstrand 1760's. 255. 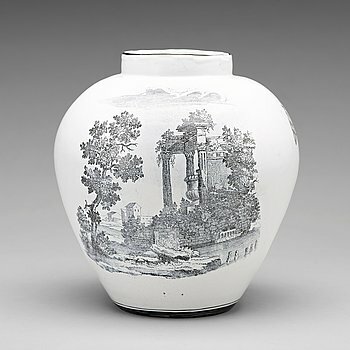 A Swedish Marieberg faience pottpurri vase with cover, 18th Century. 256. 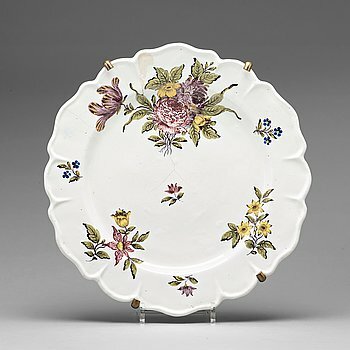 A Swedish Rörstrand faience serving dish, 18th Century. 257. 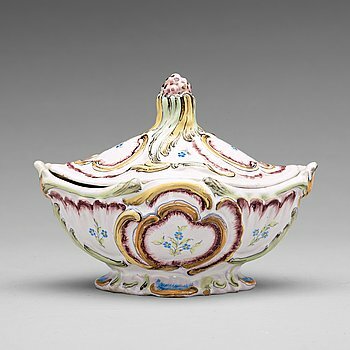 A Swedish Rörstrand faience tureen with cover, dated 9/2 1773. 258. 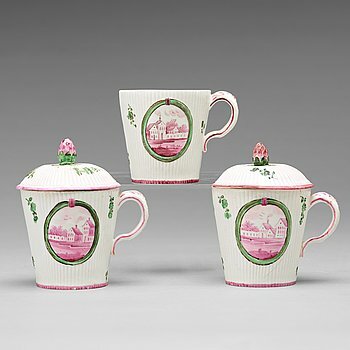 A pair of Marieberg soft paste cups with saucers, 18th Century. 259. A set of 11 Marieberg soft paste custard cups with covers, 18th Century. 260. 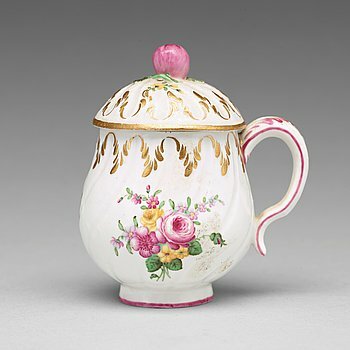 A Swedish Marieberg faience jar, 18th Century. 261. A Copeland creamware part dinner service, early 19th century. (163 pieces). 262. A Frankenthaler porcelain figure of a putto playing bag pipe, Germany, 18th Century. 263. A white glazed porcelain figure of a courting couple with a cat, Frankenthal, 18th Century. 264. A Ludwigsburg figure of 'Ariadne', Germany, end of 18th Century. 265. A Ludwigsburg allegorical porcelain figure, Germany, late 18th Century. 266. A Ludwigsburg porcelain figure, Germany, 18th Century. 267. A allegorical figure group, unmarked, presumably Ludwigsburg, Germany, 19th Century. 268. A Meissen allegorical figure group, second half of the 19th Century. Not first quality. 269. 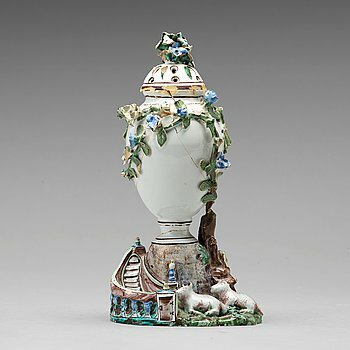 A Meissen figure of a woman preparing a rabbit, second half of 19th Century. 270. A Meissen figure of 'Harlequin with a beer tankard', Germany, late 20th Century. 271. A Meissen figure of 'Boreas and Oreithyia', early 20th Century. 272. A pair of Berlin porcelain candle sticks, 18th Century. 273. A Berlin figure group of a courting couple, early 20th Century. 274. An allegorical Berlin figure group, end of 19th Century. 275. A Royal Copenhagen porcelain figure of a courting couple by a well, Denmark late 18th Century. 276. A Royal Copenhagen allegorical figure representing 'Asia', Denmark, 1920. 277. A Royal Copenhagen allegorical porcelain figure representing 'America', Denmark, 1920's. 278. A Royal Copenhagen allegorical figure group of Africa, Denmark, early 20th Century. 279. A Royal Copenhagen allegorical porcelain figure representing 'Europe and the Bull'. Denmark, 1920. 280. Royal Copenhagen, A Royal Copenhagen 'Flora Danica' tureen with cover, Denmark, 20th Century. 281. A set of six Russian dessert dishes, Imperial Porcelain manufactory, St Petersburg, Czar Nicholas I (1825-1855). 282. A pair of Russian wine coolers from the Golden Service, Imperial porcelain manufactory, St Petersburg, Empire. 283. A Russian porcelain figure, Popov, 19th Century. 284. A Russian bisquit figure, "Bashkir", Kuznetsov/Gardner, Russia, 1891-1917. 285. A bisquit porcelain figure of Sobakevich from Gogol's 'Dead Souls', Gardner, Moscow, 1880-1917.